General Motors Reports Slight Drop in U.S. Sales and Market Share - Cox Automotive Inc.
General Motors reports earnings Wednesday for its fourth-quarter and full-year 2018. 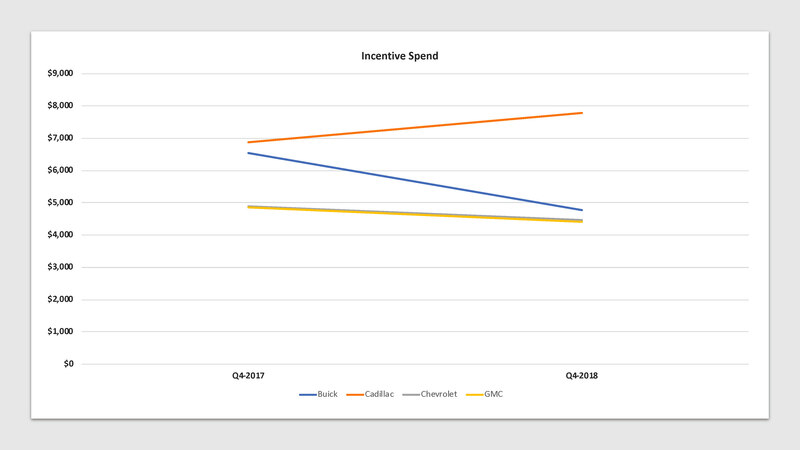 Here’s Cox Automotive data on how sales, market share, incentives and prices performed in the quarter. 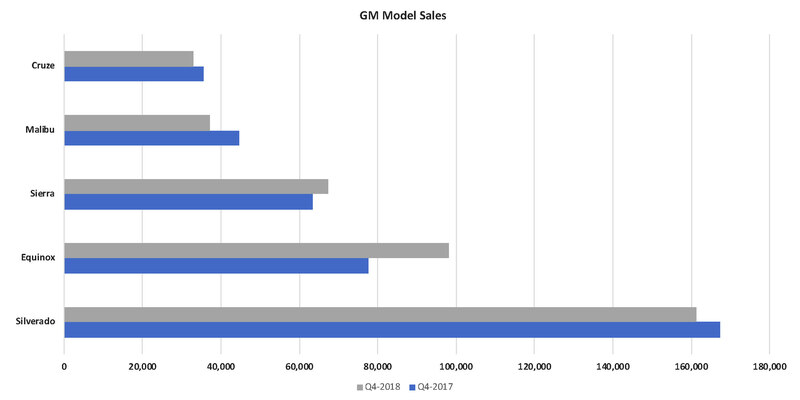 In the U.S., GM’s sales for the final quarter of 2018 fell nearly 3 percent. Buick saw the largest loss, down 14 percent. Cadillac and Chevrolet were off 3 percent. Only GMC posted a gain – up 4 percent. Market share declined by .7 percentage point. The Chevrolet brand accounted for most of the market share drop, down .6 percentage point, with Buick down .2 percentage point. GMC was up .1 percentage point. Cadillac was flat. In the fourth quarter, GM was ramping up production of its redesigned Chevrolet Silverado and GMC Sierra pickup trucks while selling down the previous versions. As a result, Silverado sales dipped 4 percent in the quarter, while Sierra sales rose 6 percent. The Chevrolet Equinox, revamped in 2017 as a 2018 model, posted a hefty 26-percent sales gain in the quarter. Reflecting the industry trend, sales of traditional Chevrolet sedans declined throughout the year with the Chevrolet Malibu down 17 percent and the Chevrolet Cruze falling 7 percent in the fourth quarter. In November, GM announced it would halt production at five of its manufacturing facilities in the U.S. and Canada this year. Most produce traditional cars. Among the casualties are the Cruze and the Lordstown, Ohio, plant that assembles it. The Malibu remains in the line-up for now. With its focus on profitable sales, GM reduced incentive spending in the fourth quarter by 9 percent to an average of $4,651 per vehicle from year-end’s very high $5,000 plus. GM dialed back Buick incentives from 2017’s high level that surpassed $6,000 per vehicle, by 27 percent to $4,775 a vehicle, its lowest amount since at least 2013’s fourth quarter. Chevrolet and GMC incentives dropped 9 percent from the year earlier with the new truck in the market and requiring less discounting. However, Chevy and GMC incentives remained relatively high for the two brands due to the intense competition in the pickup- truck and utility segments. In contrast, GM ratcheted up struggling Cadillac’s incentives by 13 percent to more an average of $7,785, the highest level since at least 2013’s fourth quarter. 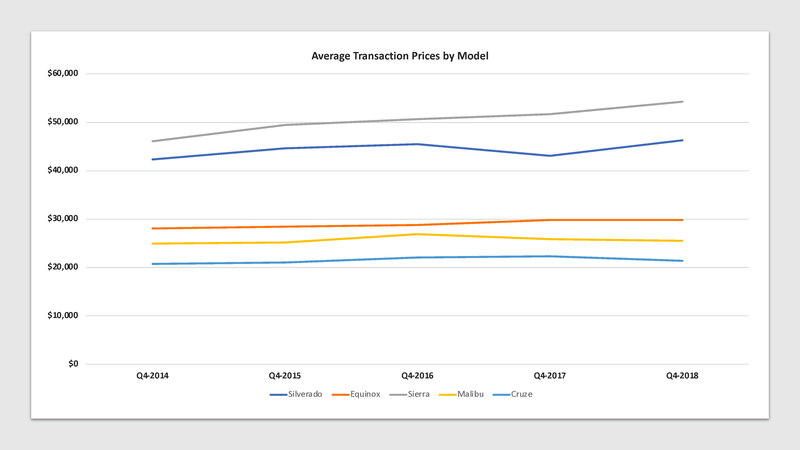 Chevrolet and GMC saw a bounce in the fourth quarter in average transaction prices (ATP), largely due to the introduction to the high-volume Chevrolet Silverado and GMC Sierra. The ATP on the Silverado climbed nearly 8 percent to $46,241 and 5 percent to $54,218 on the Sierra. Those are the record-high ATPs in a fourth quarter on both trucks. Like their sales direction, ATPs on the Chevrolet Cruze and Malibu fell.